Mumbai Masala Indian Restaurant uses their own specialised couriers to deliver their food. Short crust pastry filled with spiced potato and peas. Spinach, cauliflower, potatoes, onions dumplings mixed with chickpea flour. Chillies stuffed with spiced paneer and potato and batter freid in chickpea flour. Crispy batter fried spinach leaves topped with chick peas and potatoes, finished with yogurt, mint sauce and date & tamarind sauce. Corn on cob roasted in tandoor basted with spiced tangry dressing. Mushrooms marinated in traditional pickle spices and cooked in tandoori oven. Black pepper, fenugreek yoghurt marinated cottage cheese cooked in tandoor. Spiced potato patty with chickepea, yoghurt, mint sauce & date-tamarind sauce. Succulent chicken thigh fillets marinated in spiced yoghurt cooked in the tandoori overn. Tender whole chicken on the bone marinated in spiced yogurt cooked in tandoori oven. Lamb mince mixed with spices and skewered in tandoori oven. Lmab cutlets marinated in ginger, garlic and spiced yogurt cooked in tandoori oven. Grilled fish fillet marinated in south Indian spices. 2, samosa, 2 pakora, 2 lamb seek kebab ans 1/4 tandoori chicken. Roasted cashews and fresh vegetables cooked in a mild creamy almond sauce. Home made cottage cheese cooked in medium traditional North Indian spices with finely chopped spinach. Kashmiri specialty dumpling made with potato, cottage cheese, sultanas and cashews in rich creamy sauce. Rustic mushroom and peas curry cooked with onion and tomato finished with shallots. Traditional potato and eggplant curry cooked with sesame seeds, coconut, finished with tamarind and coconut cream. Seasonal fresh vegetables cooked with puree spinach, garlic and fenugreek. Cottage cheese and peas cooked in creamy cashew sauce. Cottage cheese cooked with diced capsicum and onions in a rustic onion tomato sauce. Cottage cheese cooked with rich creamy tomato sauce with fenugreek leaves. Tandoori roasted chicken, spices, capsicum, tomato and onion tempered with freshly ground spices in a medium sauce. Chicken pieces cooked in creamy mango sauce. Chicken cooked in rich cashew sauce with flavour of cardamom and fennel seeds. Infused with coconut and South Indian spices. Hot Goan specialty ! chicken cooked in vindaloo sauce. Chicken cooked in pureed spinach, cooked with tomato garlic and fenugreek leaves. Traditional north Indian chicken pieces cooked with chicken mince finished with onion tomato masala. Tandoor-roasted chicken pan finished in creamy tomato sauce and subtly spiced with fenugreek leaves. Diced lamb cooked in aromatic Kashmiri spices in rich onion tomato sauce. Roasted cashew and lamb cooked in a mild creamy almond sauce. Fiery South Indian favourite! Chicken cooked with tangy vindaloo spices in a traditional hot gravy. Lamb cooked in pureed spinach, tomato, garlic and fenugreek leaves. Skewered lamb mince kebabs cooked it rich onion tomato curry and finished with fresh coriander. Chef’s special goat curry, black cardamom, cinnamon, onion-tomato gravy and match-stick potatoes. Beef cooked in rich creamy cashew sauce with flavour of cardamom and fennel seeds. 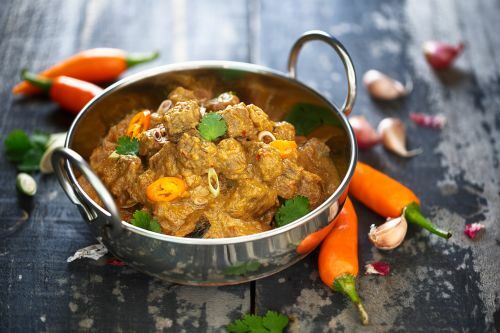 Beef cooked in aromatic south Indian spices and finished with tamarind coconut cream. Hot goan specialty beef cooked in vindaloo sauce. Beef cooked in rich clarified butter and finished with onion tomato masala. Beef cooked in south Indian style mint and spinach base creamy sauce. Hoki fillet simmered in coconut curry with vegetables. Fish cooked in south Indian style mint and spinach base creamy sauce. Hot Goan Prawn curry with traditional pickle flavour. Prawns cooked with diced capsicum and onions in a rustic onion tomato sauce. Prawns cooked with coconut cream with special south Indian spices. Lemon flavoured basmati rice with curry leaves and mustard seeds. Green peas, onions and turmeric flavoured basmati rice. A Traditional dish of vegetables and Basmati rice cooked with saffron, chillies, mint, ginger and yogurt. A Traditional dish of chicken and basmati rice cooked with saffron, chillies, mint, ginger and yogurt. Rose and cardamom flavoured reduced milk dumplings. Homemade Indian ice cream with variety of flavours . Short crust pastry filled with chocolate served with berry compote and ice cream. Yellow lentils tempered with cumin seeds , onions, tomatoes and fresh coriander. Yellow lentils tempered with cumin seeds , onions, tomatoes and finished with spinach puree. Kidney beans, chickpea and black lentils slow-cooked crushed ginger, garlic and spiced tomatoes. Naan with dry fruits, coconut and sultans. Naan with spiced lamb mince. Mint flavoured wholemeal layered bread.